The second flavour in this mini-series of shaker reviews is the Yuzu Pepper Flavoured shakers from McDonald's Hong Kong. My friend Andrew lives in HK so was able save me a packet of these together with the flavour I'll be reviewing tomorrow, Black Truffle until we met a couple weeks later. Yuzu Pepper and Black Truffle were being offered together with Honey BBQ and Seaweed, both flavours from Hong Kong that I've reviewed before so I didn't think it was worth a second (or third) try. 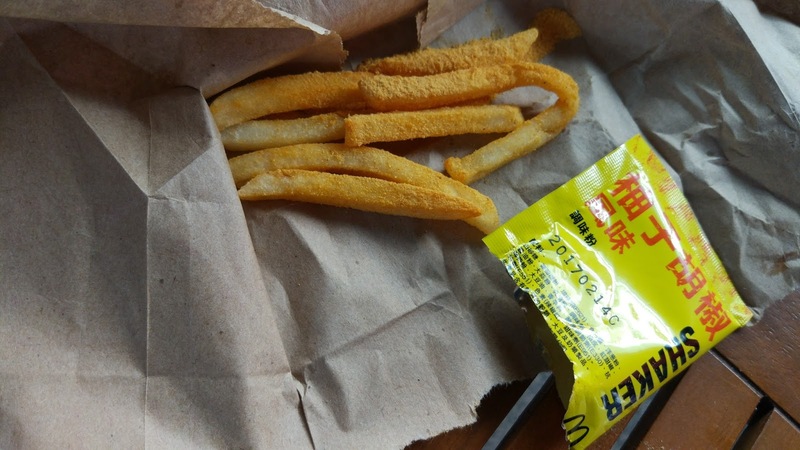 Now this isn't the first time I've Yuzu/Yuja flavoured items from McDonald's before, but if you haven't read my old reviews from Singapore or Korea, Yuzu is kind of like a soft, wrinkly Mandarin Orange. 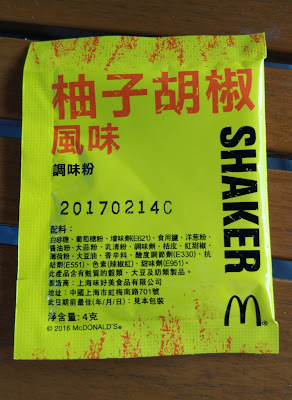 Since I was reviewing four shakers at once, like the Garlic Butter, I only used a portion of the package together with a handful of fries. 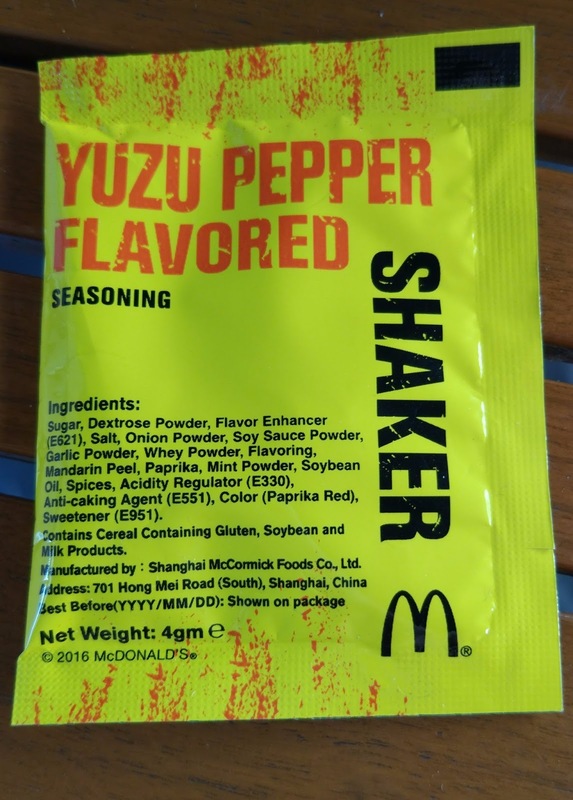 The seasoning itself gave off a fruity smell, so it was clear they really went with the Yuzu flavour over say, the pepper. I gave my fries a quick shake and each one collected a nice consistent coating - much better than the Garlic Butter did under the same conditions. The orange colour was broken up by small black flakes which aren't really noticeable in the photos. Since the only dark ingredients on the list were Soy Sauce Powder and Mint, I'd guess it was mint just by the sparseness of them all. Actual Yuzu fruit is as like a cross between an orange, mandarin and even a grapefruit, but is slightly sweeter, but less tart than a typical orange. So as expected, these shakers were more sweet and less salty than a "traditional" seasoning shaker. 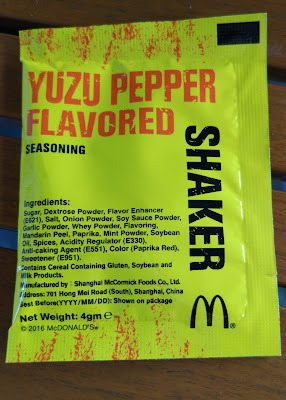 It's not surprising that Sugar was the first ingredient, but what was less exiting was that they didn't use any real Yuzu fruit in it at all. The citrusy flavour which was noticeable and relatively pleasant either came from the vague "flavouring" but more likely the "Mandarin Peel" hidden further down the ingredient list. 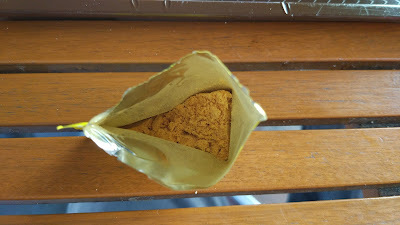 The pepper in the name didn't mean that it would try and be spicy like the majority of items that use it in the name, but rather it was heavy on the also-sweet paprika pepper which even though it was two rather sweet flavours together in one, worked well with one another. I'm very glad this didn't end up being simply a rebadged of the lacklustre "Citrus" flavour that they sold in 2014 but something new all together. 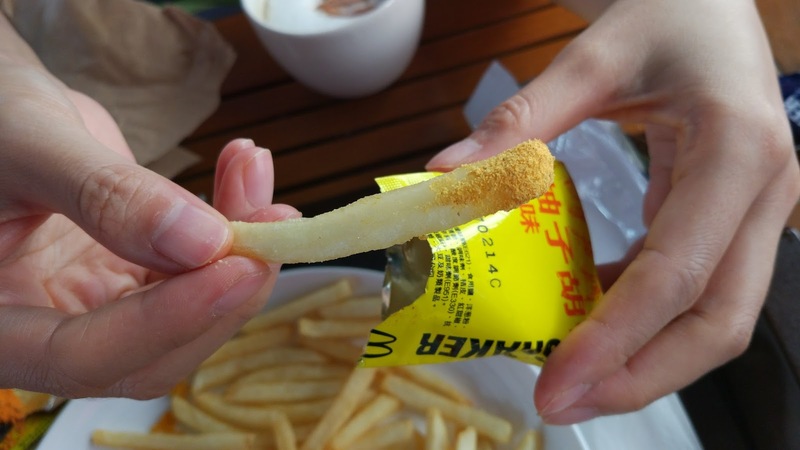 An alternative from the salty McShakers flavours are a welcome change, especially when they don't end up being sickeningly sweet. 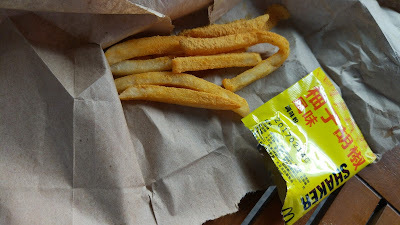 It had a nice balance and a flavour that I'd be willing to eat again.